Mark Teague’s fractured fairy tale version of The Three Little Pigs opens on a farmhouse scene, as the three pigs are told that their farmer owners will be moving to Florida. Upon leaving the farm, the first pig decides to save money for potato chips by building his house out of straw. Following the junk food theme, the second pig saves money for “sody-pop” and builds his house out of sticks. Although the straw and stick houses are admittedly too small and too “dusty and musty,” the first and second pigs don’t seem to mind, as they are preoccupied with a shared love of junk food. The third pig, spending all of her money on bricks and mortar, doesn’t have any money left over for food, so she responsibly decides to plant a garden and is very satisfied with her efforts. On the other side of town, the hungry wolf (after being snubbed by the town’s local fast food joints) is so impressed with his skills in blowing down the first and second pig’s houses that he allows each of the portly siblings to escape to the third pig’s house. After trying relentlessly to blow the third house down, the wolf faints. Instead of running off, the pigs revive him with smelling salts, feed him, and welcome him into their home. Regardless of the message, children will have an animated, fun time reading this tale. They will laugh at the child-like antics of the wolf and enjoy the cartoon-like oil painting illustrations that move the plot along smoothly. In addition, children will be mesmerized with Teague’s bright use of color and his strategic placement of farm animals (cats, ducks, rabbits, and roosters) throughout. Even if confusing, the happy ending for all of the characters will leave children with an overall feeling of satisfaction. Although cultural displays are not at the forefront of this book, there are some physical differences in the three pig protagonists that are not displayed in the original version. The first and second pigs (the irresponsible ones) appear to be male and dirty with brown spots covering their bodies while the third pig (the responsible one) appears to be female, as she’s seen with a blue bow on her head. Although it can be inferred from the illustrations, the gender of the pigs is never revealed directly to the reader. As there is a distinct beginning, middle, and end and a limited number of characters in Teague’s variant tale, librarians are afforded an excellent opportunity to use a tri-fold felt board to display cut-outs as the story is being told. Happenings in the beginning of the story would go on the left side, happenings in the middle in the middle section, and happenings in the end on the far right side of the board. This would serve to both help children better understand the parts of a story and encourage participation and discussion. 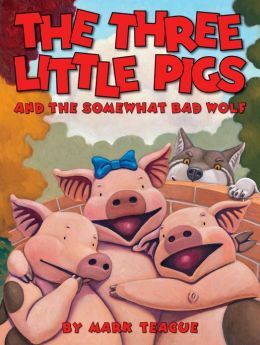 While The Three Pigs and the Somewhat Bad Wolf has not won any awards to date, it has received several positive reviews from School Library Journal, Booklist, and Publishers Weekly. Books in Print. Texas Woman’s University Library. Accessed September 13, 2013.